Can anyone stop Ken Roczen? Through four rounds, it doesn’t appear so. Roczen rode two brilliant motos today at the fourth round of the Lucas Oil Pro Motocross Championship at High Point to extend his championship lead to forty-one over Eli Tomac. Roczen has now won seven of the first eight motos (if not for a mechanical it could have been eight straight) to being the season. For a brief moment in the first moto, it looked like we would see an Eli Tomac/Ken Roczen showdown, as Tomac quickly moved into second. But shortly after pulling to within striking distance of Roczen, Tomac made a mistake and lost the front end in a deep rut and fell back to sixth. This allowed Roczen to march to a more than fourteen second lead. The start wasn’t there for Tomac in moto two. By the time he moved past Jason Anderson into second on lap 3, Roczen was already out to a 5.4 second lead. Roczen would stretch it to just over 7 seconds on lap 9, before Tomac cut it back down to 4. 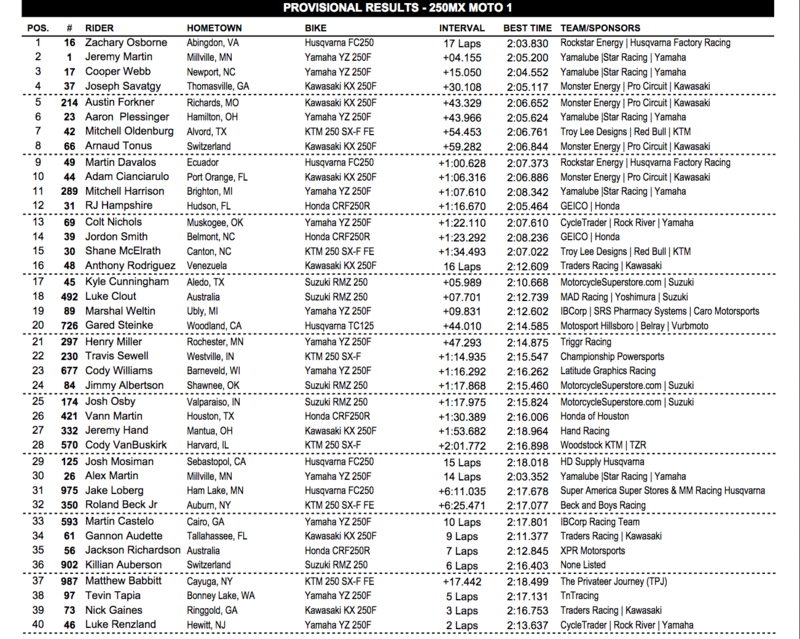 Again, Roczen quickly put distance between himself and Tomac and won the moto by just under 12 seconds. Today was different for Marvin. Not only was he under the tent by himself, with both Dean Wilson and Ryan Dungey out with injury, but he was also without his mechanic Frankie Latham, who missed the race to attend a wedding. Ryan’s brother, Jade, filled-in for Latham this weekend, with Ryan's mechanic Carlos Rivera helping out also. Jade Dungey and Marvin had previously worked together at the Motocross of Nations. If things feel a little different in pits at Round 4 of Lucas Oil Pro Motocross at High Point Raceway in Mt. 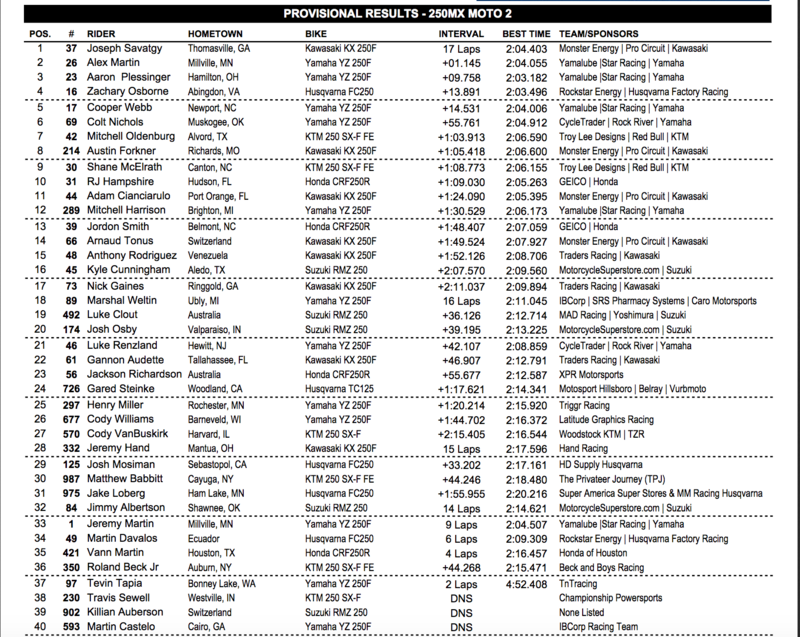 Morris, Pennsylvania, it’s because for the first time since Steel City 2007, Red Bull KTM’s Ryan Dungey is not present. The defending 450MX champion sustained a cracked vertebrae in his crash at Round 3 of the championship at Thunder Valley and is scheduled to miss multiple rounds—if not the remainder of the championship. We spoke with Dungey’s trainer Aldon Baker a few days after the announcement and he told us that after the Thunder Valley race on Saturday, Dungey told him his neck felt a little stiff on one side, but nothing too bad. In other injury news, Honda HRC’s Trey Canard crashed at his home in Oklahoma on Monday and is suffering from a bulging disk in his back. He will be evaluated weekly, but there is currently no timetable on his return. Yoshimura Suzuki is hoping to get James Stewart and Blake Baggett back next week from shoulder injuries next weekend in Tennessee; Matt Bisceglia will continue his fill-in for the team this weekend. In actual racing news, Ken Roczen enters Round 4 winning five of the first six motos (only a mechanical keep him from being perfect) and holds a twenty-nine point lead over Eli Tomac. In the 250 class, Joey Savatgy carries the red plate for the second time this year, leading two-time 250MX champion Jeremy Martin by three points. Plenty of interesting storylines to talk about in the first 250 moto. Jeremy Martin grabbed the early lead, but was quickly passed by older brother Alex. When fastest qualifier Zach Osborne moved into to second, he began to chip away into Alex’s more than 4 second lead and leave Jeremy Martin behind. Check out the how the lead margin broke down. On the ninth lap, Alex made a huge mistake and went off the track allowing Osborne to take the lead. Alex then fell back to nearly three seconds behind on lap 11. Alex picked the pace back up and cut the lead to 2 seconds late in the race. He was actually closing back in before his bike started smoking due to a mechanical issue. Jeremy quickly got by. Then Cooper Webb. Then Joey Savatgy. Then, with 2 laps to go, Alex’s bike finally let go. He did not finish the moto. Although Jeremy closed the gap down the stretch, Osborne held on for a comfortable 4.1-second win. It is the first ever win for Zach in 250MX. Webb held on for the final podium spot. Points leader Joey Savatgy finished fourth, with rookie Austin Forkner in fifth. Aaron Plessinger was running seventh early, before crashing, falling outside the top ten, and then coming all the way back to sixth. Mitchell Oldenburg was 19th after the first lap and came back to seventh. Arnaud Tonus, Martin Davalos and Adam Cianciarulo rounded out the top 10. - Cianciarulo crashed late in the race while running 7th. - Jordon Smith crashed out of the top five early in the race. He finished 14th. - Star Racing and Pro Circuit Kawasaki had five riders inside the top six (Star 3; PC 2). - Traders Racing Kawasaki’s Nick Gaines returned from a broken femur sustained this off-season. He did not finish the moto. Yamalube/Star Racing Yamaha’s day went from bad to worse in the second 250 moto. After Alex Martin's bike began pouring smoke—and eventually failed—in the first moto, younger brother Jeremy suffered a similar problem in the second moto, albeit earlier in the moto. If there is a silver lining in all of this for Star, it will be that captured three of the top five spots in the moto. But the points lost for two title contenders could be a major factor later in the series. Adam Cianciarulo took the holeshot and held the early lead over Jeremy Martin, first moto winner Zach Osborne and points leader Joey Savatgy. It was Savatgy that made the first move, first getting around Jeremy Martin, then a lap later around his teammate to take the lead. After the first moto disaster, Alex Martin was quick to move around his brother Jeremy and then Cianciarulo to move into second. Another Star rider was making waves, as Aaron Plessinger moved into third. 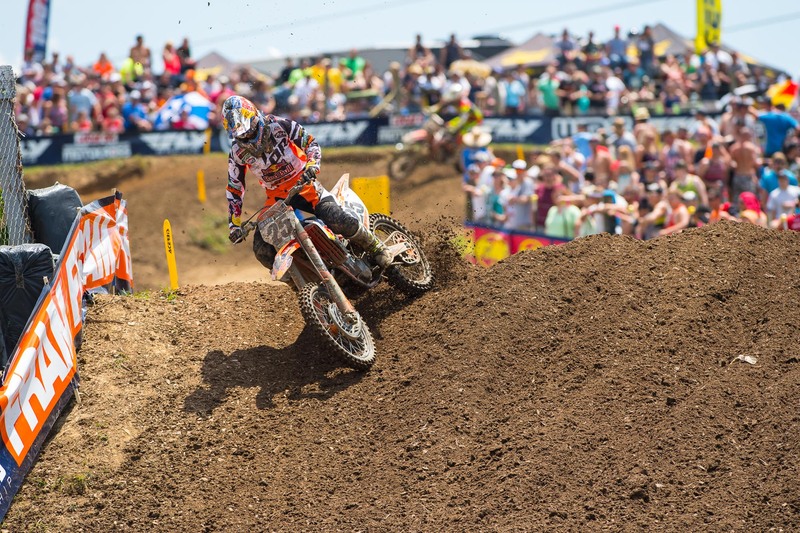 His hard charge lost steam late in the moto, and he wasn’t able to move past Alex or Savatgy. Both Alex Martin and Plessinger keep Savatgy honest throughout the moto, but the points leader was steadfast and made up a ton of points. Savatgy would split the overall with Zach Osborne, but will be credited with the win due to finishing better in the first moto. Bringing up the Star top five was Cooper Webb. Colt Nichols finished a career-high sixth, with Mitchell Oldenburg, Austin Forkner, who was outside the top twenty after the first lap, Shane McElrath and RJ Hampshire rounding out the top ten. Cianciarulo finished eleventh after leading early. - Margin of victory: 1.145 seconds for Savatgy. 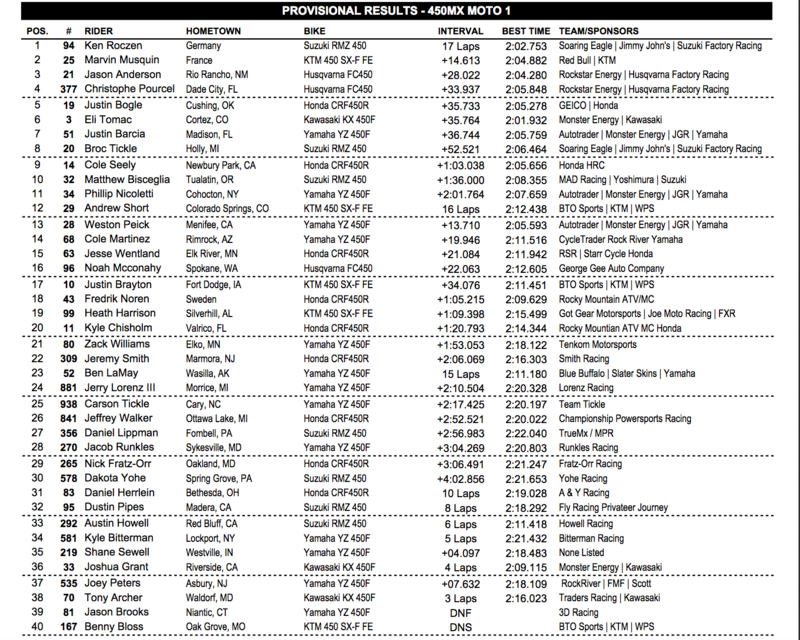 - Fastest lap: Aaron Plessinger, 2:03.182. - Martin Davalos pulled out of the race early. We’ll update once we know more. With Ryan Dungey out, most considered Eli Tomac the only rider able to keep Ken Roczen honest. It finally looked as if we would get a Roczen/Tomac showdown, as the two sat first and second early in the first moto. But Tomac made a huge mistake and lost the front end in a deep corner and fell back to sixth. This allowed Roczen a clear track and he quickly stretched his lead to just over 14 seconds with more than 21 minutes plus 2 remaining in the moto. As Roczen ran away to his sixth moto win (of seven) on the season, Marvin Musquin, Cole Seely, Christophe Pourcel and fastest qualifier Jason Anderson battled for second. Anderson held second early, but fell back to fourth, and then fifth. Anderson said he tipped over at some point in the race. He then found his momentum and passed Pourcel back for fourth and then Cole Seely for third late in the moto. With under 5 minutes plus 2 in the moto, Anderson closed to within a second of Musquin. But with two laps to go Anderson made a mistake allowing Musquin to cruise to second—a career best finish in 450MX. Tomac moved into fifth late in the race after Seely crashed, but lost the spot to Justin Bogle, who was outside the top ten after lap one, with half a lap to go. Tomac would finish sixth. Pourcel held on for fourth—a season’s best—with Justin Barcia, Broc Tickle, Seely and Matt Bisceglia rounding out the top ten. - Margin of victory for Roczen: 14.613 seconds. - BTOSports.com-WPS-KTM rookie Benny Bloss did not start the moto. We will have more information as it’s known. - Josh Grant had a hard crash in practice and pull out of the moto early. It’s going to be tough for anyone to wrestle this championship away from Ken Roczen, who is clicking on all cylinders at the moment. 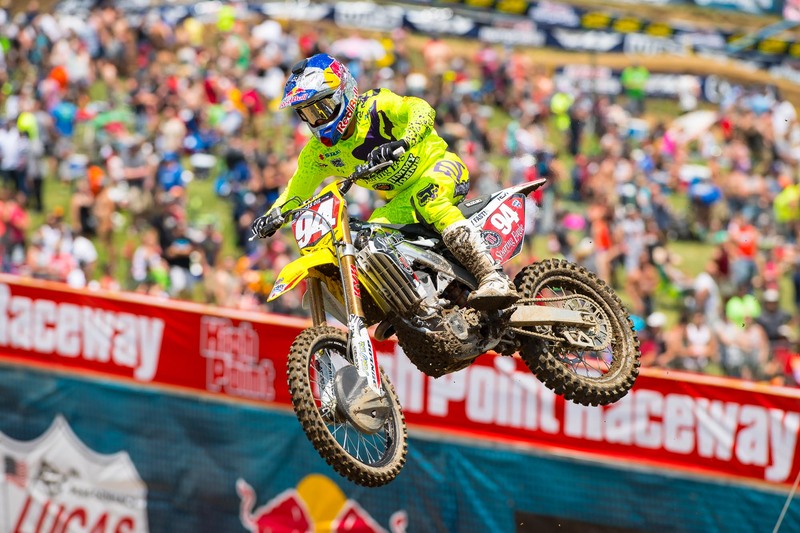 Another moto win for Roczen—his seventh of eighth—came in the second 450 moto at High Point. After stealing away the early lead from Justin Barcia, Roczen built a more than five second lead early and stretched it to over eleven by race end. Eli Tomac was able to run the pace of Roczen for much of the race, the problem was by the time he moved into second, Roczen was already 5.4 seconds clear. With a rider of Roczen’s ability, you just can’t give up that much time early in the race. Check out how it broke down. Lap 2: Tomac around Barcia for third. Lap 3: Tomac around Anderson for second. Tomac was able to cut the lead down from 7.2 to just over 4 seconds, but he wasn’t able to move it any further. At the end, Roczen built the lead back up by more than 11 seconds. Roczen now has three overall wins in four rounds. Jason Anderson rode to a lonely third with Marvin Musquin and Barcia rounding out the top five. Cole Seely got around Justin Bogle for sixth on lap 8 but wasn’t able to close on Barcia. 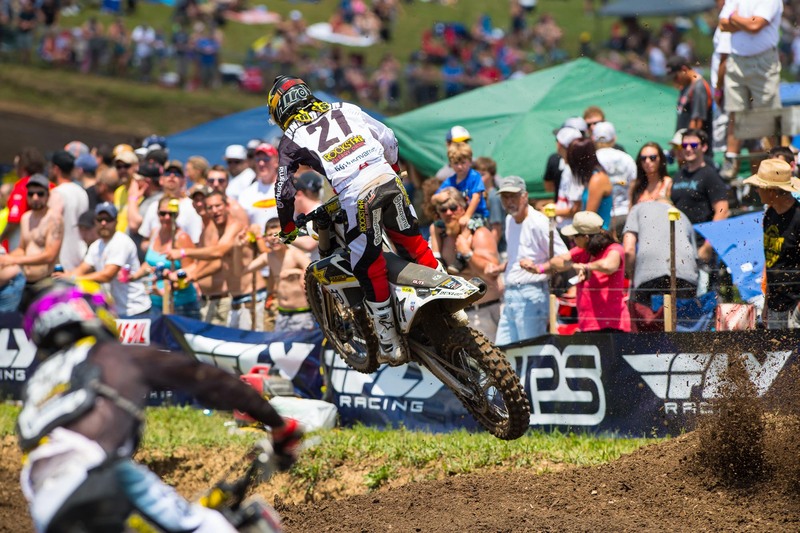 Bogle would finish seventh ahead of Weston Peick, Christophe Pourcel and Broc Tickle. There was an issue with live timing at the end of the race. We will update results and points as soon as they are available.